Here’s the thing: if this were a review of just one sandwich, it’d be pretty damn positive. I have friendly things to say about that sandwich. I enjoyed it. We got on just fine. Hang around, and I'll tell you all about it. But I don’t review sandwiches, I review restaurants, which means I ordered a bunch of other stuff besides. And some of that stuff wasn't so great. Sadly, the rules are that I have to tell you about those too. I don't think it's unfair. Kracklin, on Market Street, may be a sandwich shop. Or, to use their description, a “roast joint”. 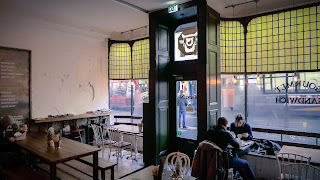 But its website also calls it a restaurant with a "lovely, recently refurbished dining area and a full bar menu...the ideal spot for a long lunch and chat with friends". Despite this pretention to greatness (the sign on the window has the word 'Gourmet' writ large), I’m willing to bet that something like 80% of the orders they take are for sandwiches. I'd also wager that most of the people who order them are pretty happy with what they get. I doubt many of their clientele have even tried their more substantial offerings but, being a thorough sort, and hungry, I did. The problem about calling yourself a restaurant is that, however many people order something, if it’s on your menu it had better be good. Which brings me to their steamed greens, gravy and chips. Let’s deal with gravy first. We ordered a portion of their poutine, a Québécoise junk food staple consisting of chips, fresh cheese curds and gravy. 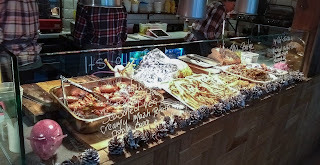 I presumed that a place which specialises in the roasting of meats would by default have phenomenal gravy, but no deal. Kracklin’s was oddly lacking in any kind of meaty tang, depth or backbone. It didn't taste as if it had been produced in situ. While I’m whinging, I should also say that the chips were flaccid and uninspiring and that the serving of curds, which in any case lacked the freshness that is required to make this dish work, was paltry. 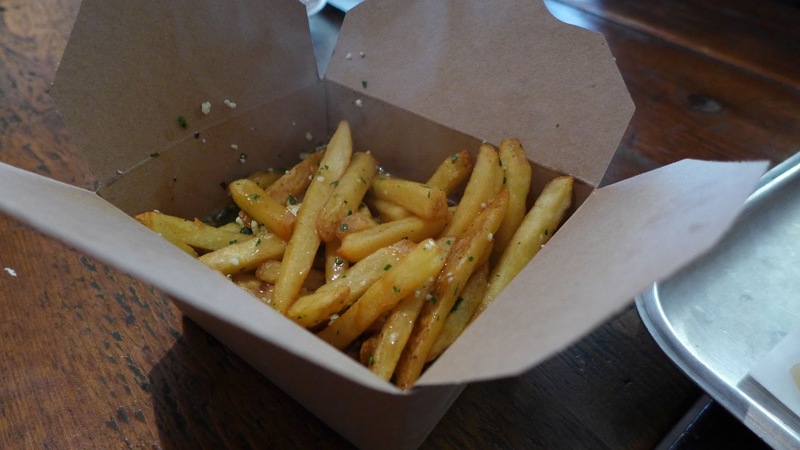 At £4.50, you can safely avoid this facsimile of the real thing (for a more substantial, and cheaper, cheesy chips and gravy experience, if you must, try the Town Fry a couple of doors down). Problem number two was a portion of “steamed greens”. At four quid, I guessed they might be some sort of collard greens, maybe cooked in the deliciously salty deglazed scrapings of a roasting tray. Nope. 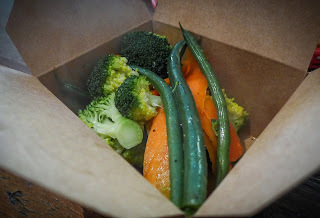 We got a small punnet of broccoli, french beans and carrot, bland, unseasoned and undressed. Since when was carrot even a green? 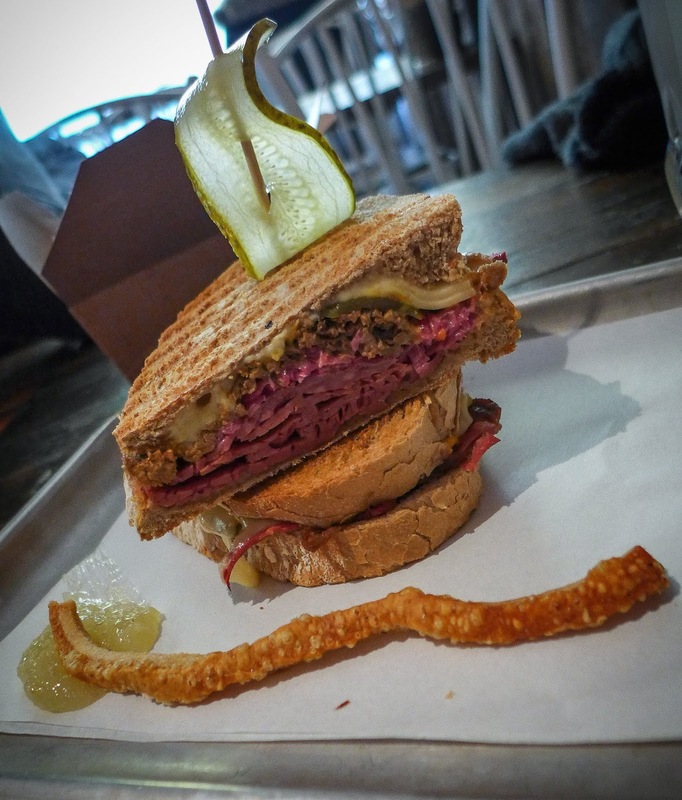 So, don’t bother with any of that, but do consider trying their “Badass Reuben”. The only slight problem with it is that it's not a Reuben. It has dark brisket along with salt beef, and substitutes pickled red cabbage for sauerkraut; it has Thousand Island instead of Russian, and the bread isn't buttered on the outside before it's toasted, which is how you make a Reuben. It also, weirdly and defiantly of the Jewish tradition (though it's not actually a kosher dish, of course), came with a side of pork crackling (Kracklin, geddit?). But no matter, this was still a belting sandwich. Salty, juicy meat, tangy pickles and mustard, crunch from the cabbage and melting cheese, all neatly sealed within its jacket of Geordie Baker toasted rye. 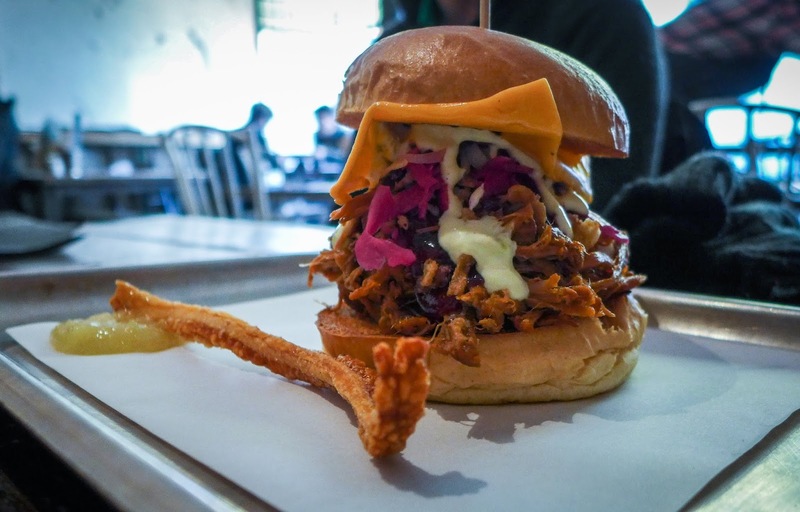 If sandwiches can be judged on the impact of their first bite, this was a winner. At £9.50 a pop, some may wonder why a bit more salt beef couldn’t have been crammed into it. To be sure, you’re a long way from Katz’s deli in New York, with its mile high layers of pastrami (for me, the only true meat choice for a Reuben). However, Kracklin’s version was alright by me, notwithstanding rye bread that was a bit light on the rye. And dry. My tablemates were happy enough too. 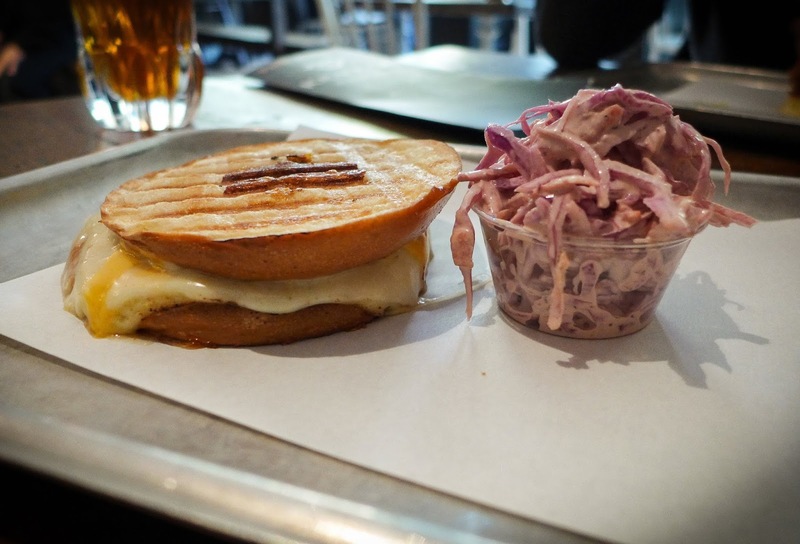 For the vegetarian, choice was limited, but the “Inside out grilled cheese” did the trick. It consisted of a magma flow of three types of oozing fromage inside a back-to-front toasted bagel with a pot of decent coleslaw on the side. I was impressed with the “Filthy P.I.G.”, however a host of accoutrements including green chilli aioli and pickled pink onions couldn’t disguise the fact that the pulled pork on which it was based lacked real depth, smokiness or textural contrast. An additional side of truffle parmesan chips, being based on the same poorly fried spud as the poutine, wasn't great. 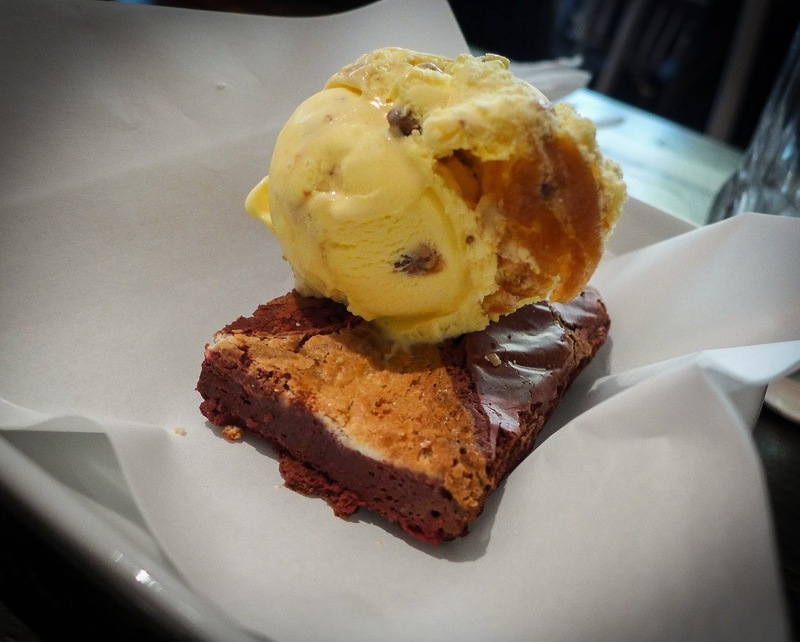 The only puddings available were slabs of the estimable Pet Lamb Patisserie’s brownies, with or without ice cream. This is fine. If you’re not going to make something yourself, at least buy in something reliable. I did wonder, however, how many of these are being sold -- ours were a bit on the dry side. The red velvet brownie, one of the few Pet Lamb offerings I hadn’t tried previously, was decadently good, especially when lubricated with some excellent salted caramel ice cream made by I know not whom, as I forgot to ask. Sorry. Service was functional but friendly. You order at the counter then grab a seat. The "recently refurbished" interior is all whitewashed distressed walls, mismatched wooden furniture and an attractive glass frontage. Dependent on your views on interior design it's either pleasingly louche or not quite finished. 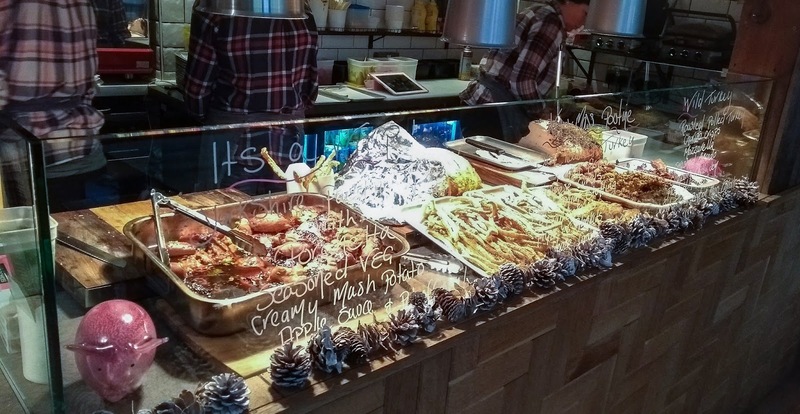 On a late December afternoon it was certainly a bit nippy, despite the counter hot-lamps keeping the attractive display of roasted animal parts warm. The drinks selection is decent. You can tell the three of us had different plans for the rest of the afternoon, with our order comprising a latté, a ginger beer and a Sierra Nevada. It took us a while to figure out what used to be in this location. I think it may have been Godfather, an unmourned Italian. I suppose the moral of this story is that you should focus on what you’re good at and get better at what you’re not. Kracklin is good at making sandwiches, of that there is no doubt. Pricey sandwiches maybe, but good ones. The rest of it: not quite so much. 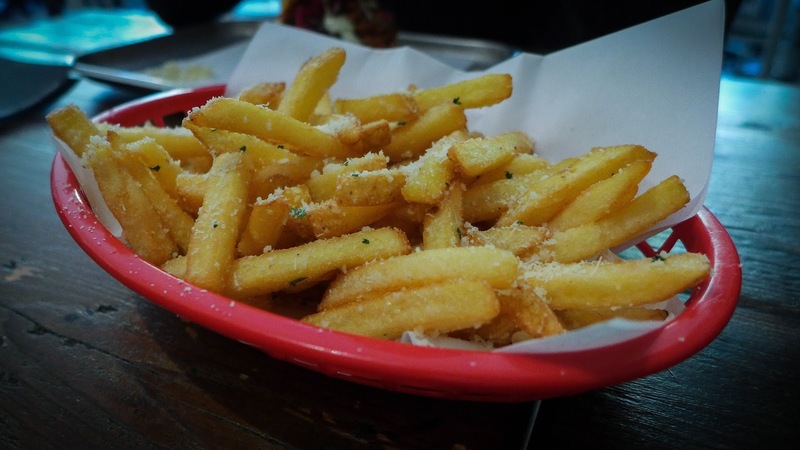 If they could sort out those chips and gravy - I’m talking proper, meaty, knee-tremblingly good gravy, and crisp, fluffy fries - I’d be back in a flash. As it is, I might possibly join the queue of sensible people who just order a sandwich and then get on with the rest of their day. I mean, what idiot would do anything else, in a sandwich shop? Yes, I'm no longer submitting these posts to The Journal. But they will continue to appear here every Saturday, as they have done for the past 7 years. Sorry you're giving up the paper - local journalism is still quite important, even if ours has lost its food critic! Thanks v much for your support and I hope you continue to read my pieces here, Stan. Not much sarnie there for £9.50 mind. I remember the Godfather fondly, but only with regard to my glory days of the nineties when a student. It was fine then, but it went into a steady decline later on and took soooo long to die. A relief to all when the end finally came. (A pity the Journal isn't carrying this any more. One of the drags with local papers is the often poor writing standards, and this stuff would lift the average score a lot). I enjoy your reviews and find our tastes are quite aligned. Thank you for introducing me to several excellent local venues. However, I'm slightly disappointed by this review. While I agree that the extended menu does not live up to the standard of the sandwiches, I think to award 2 stars is out of line with previous reviews; that suggests the food at Kracklin is on par with Pizza Express and The Botanist in your opinion. I don't think you can honestly stand by that statement? These are the best sandwiches in town, in my opinion. For the venue to be awarded two stars for food based on side dishes is similar to marking down Cal's for their chips or Havelli for their chicken nuggets. I'm not one for commenting generally but was very surprised and disappointed to see this rating. 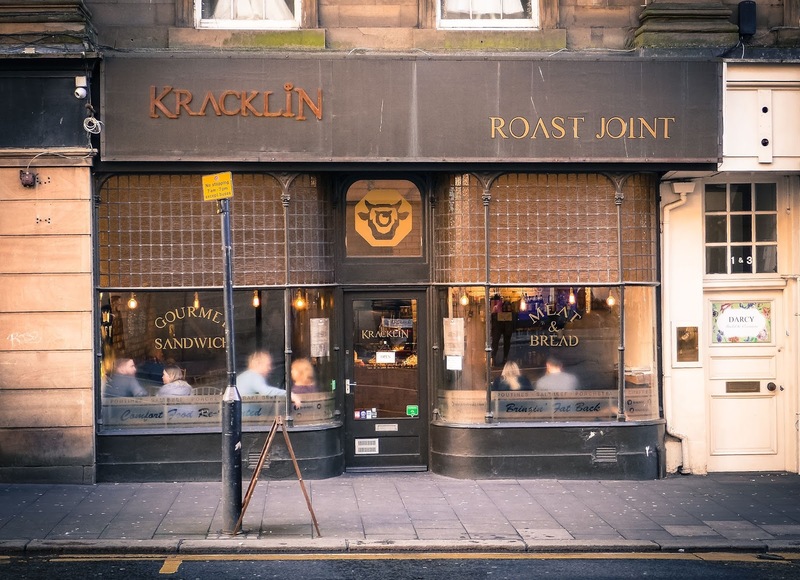 Kracklin offers something unique in Newcastle - high quality products, locally sourced, run by a local family. We need places like this to survive and thrive - I don't want to have to go to Borough Market or Katz to get a good sandwich! I can only review what I find. 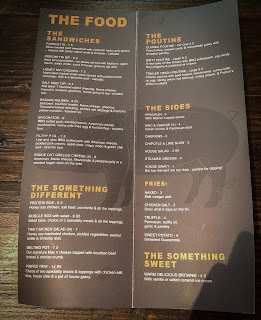 Kracklin calls itself a restaurant, so I reviewed a restaurant meal. I never rate a place based on one dish, but only on the whole experience. Even though the sandwich was pretty good (as I said), until they sort out the rest of their offering, I'm afraid the rating stands.